Planning for later life is never an easy thing to do, but it can be comforting and reassuring to know that you’ve taken care of your arrangements, including your funeral. By taking some time now, you can provide both financial and practical help for your loved ones in the future. Funeral costs continue to rise and further increases are predicted in coming years so it makes sense to make financial provision in advance. 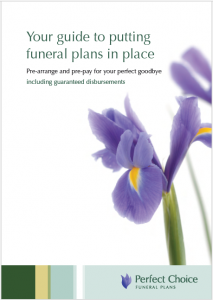 A Perfect Choice Funeral Plan guarantees that the funeral director’s costs will be covered, no matter how much prices rise. As long as the original funeral directing firm carries out your funeral and your requirements don’t change, your family won’t be asked to pay a penny more for your funeral director’s costs regardless of how long you live or what happens to costs in the meantime. Perfect Choice offer an easy payment scheme to spread the cost from one year interest free to a maximum of five years through monthly instalments*, securing the cost for a fixed monthly payment. *Instalments over 24 months will incur an additional instalment charge. Perfect choice terms and conditions.